The newborn whale broke the surface belly up and researchers were able to identify it as female. A pod of endangered killer whales welcomed a newborn into the family a few days before the start of 2015, and researchers have now determined that the baby is a female. 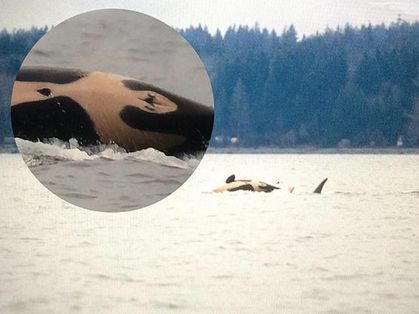 Scientists first spotted the newborn killer whale on Dec. 30, 2014, in the Gulf Island archipelago, but now the baby has been spotted again, and it appears happy and healthy. Researchers were able to identify the whale's gender while it was playing and skimmed the surface with its belly up. Newborns typically stick close to their mothers, but baby-sitting is not unusual within a pod of killer whales, so researchers have not been able to determine who the mother is yet. Ken Balcomb, a scientist at the Center for Whale Research in Friday Harbor, Washington, first spotted the baby whale swimming alongside a 43-year-old female named J-16, who has successfully given birth to three calves during her lifetime. However, if J-16 is the mother, it would contradict what scientists know about killer whale fertility. At 43 years old, J-16 is past the age that researchers believe is possible for killer whales to still produce offspring. The other possible mother is one of J-16's previous calves, named J-36. Researchers have been hoping 16-year-old J-36 would have her first calf soon, but she was not spotted anywhere nearby on Dec. 30 when researchers first noticed the newborn. The new killer whale (or orca, as the whales are also known) has been christened J-50, and she is the 78th orca in the population that swims off the coast of Washington state and Canada. Killer whales are widely distributed around the world, but the J-pod is considered an endangered group by the United States and Canada. The pod has been targeted for captive display in the past and recently has faced dwindling supplies of one of its primary food sources: Chinook salmon. Despite their name and the scathing documentary 'Blackfish' that condemned SeaWorld for keeping captive whales, killer whales are not known for killing humans in the wild. However, the animals are vicious hunters and are capable of taking down other large marine mammals, including seals, sea lions and whales. Orcas have large teeth that can grow up to 4 inches (10 centimeters) tall and they can swim at speeds of up to 34 miles per hour (55 km/h). From only two encounters, it's too soon to say with certainty who J-50's mother is, the researchers said. The Center for Whale Research will work with Canada's Department of Fisheries and Oceans to observe and photograph the newborn over the next few days, in hopes of solving the mystery. Follow Kelly Dickerson on Twitter. Follow us @livescience, Facebook &amp; Google+. Original article on Live Science.